The design approach developed from Leonardo Davinci’s lifetime creative output, which included the tiling the interior of large cathedral domes. This geometric design is reproduction of one of Leonardo’s blended with the common symbolic depiction of cellular networks as a sky dome of coverage hexagons anchored to cellphone towers. The warm earthy tetradic colour scheme is developed from a Da Vinci painting to lend a compelling human feel to an otherwise cool and highly technical product. 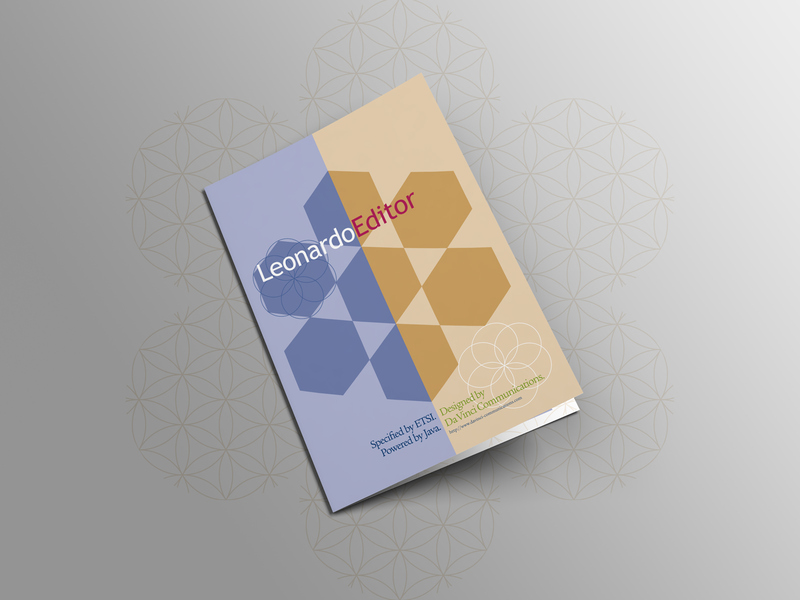 The rest of the brochures for Da Vinci’s range of software solutions develop the hexagonal tile theme and colour story of the Editor brochure. Desktop publishing is a path of discovery. Why is making something look better worthy toil? There are benefits to clarity, ease of understanding for busy people justifies hours in production. Pleasing design needs no apology, even in technical publications. Artistic expression can be placed on the same level as informational expressional. Who are Da Vinci Communications? Da Vinci Communications is a German technology company, a partnership that was established to provide the best telecom’s software testing tools. Leonardo Editor software is developed for test engineers by innovative test engineers who are inspired by the art and science of the great Renaissance artist and inventor Leonardo Da Vinci. The client designed Da Vinci logo received a re-layout and typography facelift to resolve the idea in keeping with the look of the redesigned set of brochures. Inspiration for the abstract theme came from reading the legacy brochures and researching books on Da Vinci’s works. Among the architectural triumphs Leonardo achieved was the design and construction of massive ‘duomo’, the hemispherical domes of Italian cathedrals. Visualising a cellular network as an invisible dome over the planet led to visual research into the tesselations, the repeated use of tiled shapes without gaps or overlapping that Leonardo developed to finish the interiors of his domes with. Precise observation of the tiled interiors led to drawing a design based on hexagonal tiles paired with six overlapping circles. For the two principles of the company, a man and a woman, this nonpictorial visual theme of partnership that Leonardo had designed chimed on a second level as the feminine floral circles and masculine geometric hexagons worked together intrinsically. Each of the brochures were designed to be a standalone, complete sales tool, that also work together additionally as a suite of software products. Given the complex nature of the product they are elaborate designs and given the highly specialised and technical market niche they are inpenetrable to the non-telecommunications expert. Careful attention to detail went into executing this design project as the client’s brief was fine-grained in its detail and their standards of presentation were meticulously exacting. The work was also optimised for high quality short-run colour digital printing which was ideally suited to the client’s needs. I took great care with the design in 2000 to ensure that it would age nicely, and the proof is that the suite of brochures is still in use today, 17 years later. What is the Leonardo Editor, what does it do? The Leonardo Editor is a software tool, a test system for editing specialised, highly sophisticated software, it is the best tool in the market to create and edit TTCN-2 new cell phone design testing specifications. TTCN stands for Tree and Tabular Combined Notation. TTCN defines a test notation that is used to specify black box functional tests for, for example a new cell phone design made by any manufacturer. The tests emulate the meta conditions of all known cellular networks from around the world, and they test the custom hardware and software components and different computer platforms integrated into the design of the device. The tests check the reactive communication protocols and services of the phone under all network conditions around the world so that the consumer can just insert a SIM card and go. Being a software tool Leonardo exhibits behaviour that is very useful to the experts who develop and bench test new cell phone designs (and other emerging telecommunications products and services). It combines a user-friendly interface with powerful features and uniform handling across multiple platforms. Leonardo Editor supports these laboratory testing engineers with state-of-the-art features that optimise the new cell phone design and development environment. The telecommunications industry is intrinsically complex and characterised by fast changing telecommunication technologies. Flexible, consistent standards have been developed to measure the performance of new products by. Fast moving telecommunication technology evolution in turn feeds into shorter product life cycles and so it follows that there is demand for highly adaptive test tools for this market. Leonardo Editor is very clever software for the very intelligent people, the engineers who must design and develop Smart telecommunications products and services, to budget and on-time.